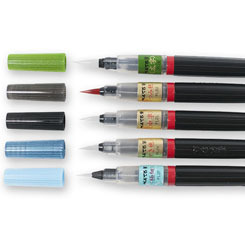 A wide range of colors in a fine point fiber-tipped marker that keeps its shape for both thin and thick lines. The ink is vibrant, non-toxic, instant drying and will not bleed through paper. 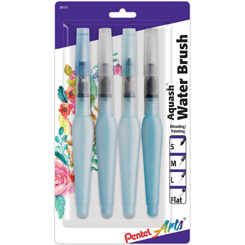 Enjoy neat, non-stop drawing and inking on the go with this refillable brush pen system. 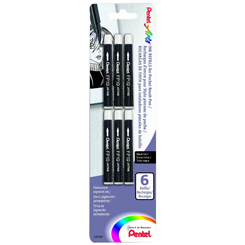 These pens consist of an ink-filled, squeezable barrel with a durable and long lasting brush tip made of flexible nylon filaments. 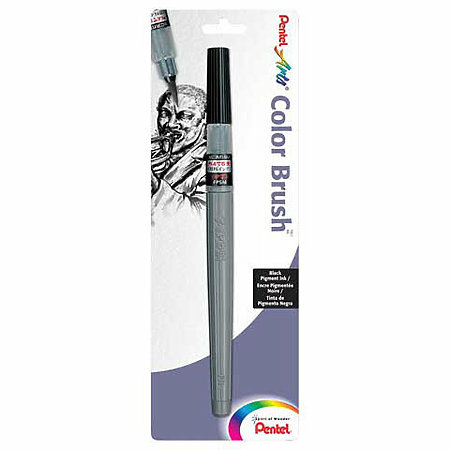 A variety of lines from fine detail to broad sweeping strokes can be produced, making the brush pen suitable for stylized design work, oriental artwork, calligraphy, cartooning and transparent watercolor effects. Available in fine, medium and bold. Refill ink cartridges are available. Create fine to broad lines with a single brush stroke using the Pocket Brush Pen. 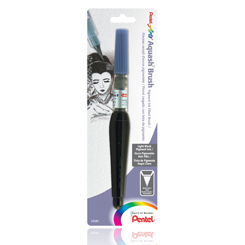 It is ideal for painting, cartooning, detailing, drawing and sketching, and refillable with permanent pigment ink. The refill pack contains two black ink cartridges. 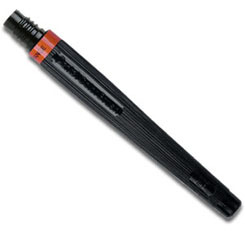 Perfect for sketching, drawing, Manga and more, this pen offers smooth, pigmented, archival ink and a tungsten carbide roller tip that guarantees a consistent line from the first to the last drop of ink. The ink is lightfast, bleed-proof, waterproof and fade resistant. Available in sizes: 0.3MM, 0.4MM, 0.5MM, 0.6MM, 0.8MM, and a set of 5. 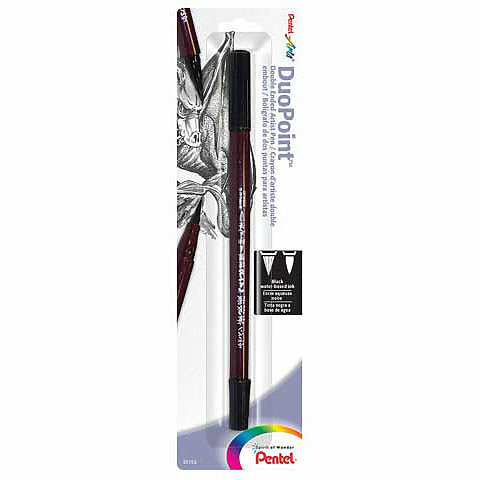 These dual-tip pens contain water-based dye ink that dries quickly and produces rich, black tones. 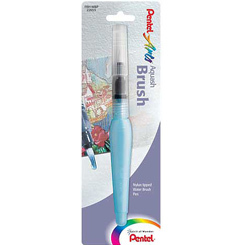 The brush end features a durable nylon brush tip that holds its point and can produce a variety of strokes and effects in illustrations and calligraphy. The other end features a plastic nib tip that allows for fine detail. Fiber-tipped pens. 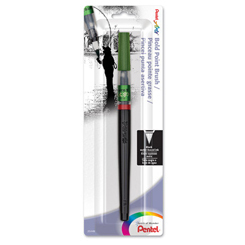 The durable fiber tips are ideal for artists, architects and anyone who enjoys sketching and drawing. The permanent pigmented ink is acid-free, fade-proof and water-resistant. 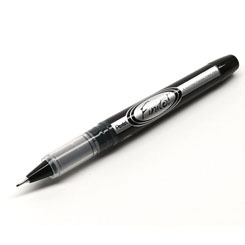 These extra-fine porous point pens contain smooth, liquid ink for easy writing. The permanent ink is fade-resistant, smear-resistant, acid-free and safe for writing checks as it won't bleed through paper. The stylish, clear cap snaps tight to keep the ink from drying out. 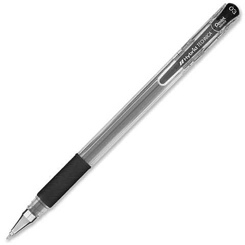 Journal and draw in fine detail with ease, thanks to the smooth-flowing gel ink and precise metal tip of the Slicci gel pen. 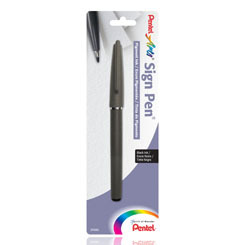 Featuring an extra-fine .25mm point (the smallest point size available in a gel ink pen), these pens are perfect for personalizing paper, cardstock, labels, tags, chipboards and die-cuts. 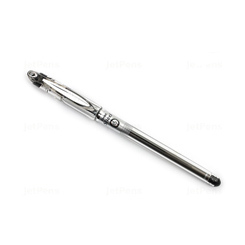 Featuring a unique, flexible nib for creating fine lines or broad strokes, this non-refillable pen with black ink is ideal for sketching and drawing. 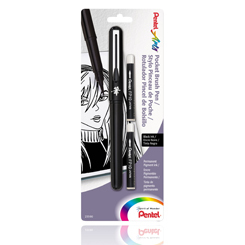 Use it to create graphic designs, cartoons, calligraphic lettering and fine detailing. 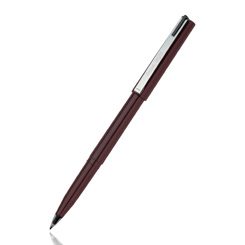 This attractive, refillable fountain pen features an ergonomically sculpted barrel, a see-through free-flowing ink delivery system, and a flexible plastic nib. 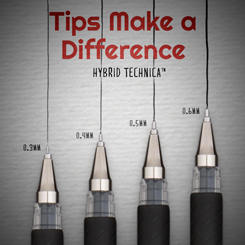 The nib allows for a variety of line widths, from thick to thin, depending on the angle and pressure applied. 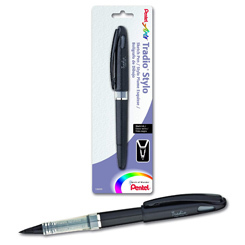 It delivers a consistent flow of black ink for smooth, effortless writing and sketching from the first stroke to the last. Replacement cartridges for the Tradio Foutain Pen. 2 cartridges per pack.